Once upon a time in a land far away and inside the head of director Hans Jurgen Syberberg, there was a king named Ludwig and he was quite mad. This may have been the best place for Ludwig to be as Herr Syberberg can dream up some mad fantastic places where Ludwig would be right at home. Ludwig - Requiem for a Virgin King (1972) is the first film of director Syberberg’s German trilogy followed by Karl May (1974) and Hitler: A Film from Germany (1978) (all reviewed elsewhere on Movie Habit). The Ludwig in this film was Ludwig II of Bavaria (1845-1886), the guy that built the tourist-magnet castle that Disney copied for Fantasyland and the main patron for Richard Wagner. 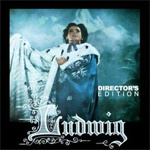 Ludwig is done in classic Syberberg filmmaking style which is to say it’s not for everybody. His films are at first glance baffling with their head-scratching tableaus and strange pacing of the action ... or lack of action. What I like about his work is that Syberberg gets the fact that filmmaking is art and not life. It is an artificial construct not reality. Both Ludwig the film and the Ludwig the man are high Romantic creations celebrating the “natural world” but done in such a stratospherically artificial manner as to be as ornate and contrived as any Bavarian Baroque church. Syberberg’s films should be in a category by themselves. For the hard-core art historians in the audience, Syberberg’s method has been called a “gesamtkunstwerk” ... a tongue-breaking term for bringing disparate art forms together. To the viewer this might look like pounding a square peg into a round hole, but in this case it is the grandly romantic and possibly futile effort that counts. When the artist is done, the viewers can say “My that’s the best job of square peg in a round hole that I’ve ever seen.” And that’s also a pretty good description of Ludwig as well. Was Ludwig a madman or an artistic genius? Yes, I know, that is a fine line often crossed and Syberberg is the right man to ask that question. His strange dreamscape vision of Ludwig’s world puts the king in a mad context where perhaps only Ludwig really knows what is going on. Is Ludwig squandering his fortune on fairy tale castles and an outlandish opera composer or does he really know that only a king can do what he is doing? Does Syberberg see Ludwig as a patron or an artist? Is Syberberg is saying that Ludwig was the real artist and Wagner was his creation? Without Ludwig would there still have been Wagner or his Ring Cycle? Perhaps not. I think that phenomena like Wagnerian operas are a product of being in the right place at the right time. The woods are full of geniuses-in-waiting but the times when the clouds part and a clearing opens are rare. Wagner may stride heroically into view but it’s on Ludwig’s stage and in Ludwig’s light. And I have to wonder how much of himself Syberberg sees in Ludwig. To me he seems to be saying “We are brothers you and I Ludwig... geniuses whom no one understands ... except for me. Now watch while I do something quirky with the next scene.” And I say “Damn, that’s the best square peg in a round hole I’ve ever seen,” because it really is. It may be that Syberberg is building a case in his German trilogy for why there was a Hitler. Ludwig was king of Bavaria at the time when Bismarck and the Prussians were uniting the German principalities into the modern German state; the new German order replacing the old one. Ludwig is the end of an era and yet with Wagner he bends the future his way. Rightly or wrongly, Wagner is credited for being the tune-smith for the Nazis. And being the most Romantic of the Romantics, he might win the prize. Would there have been Nazis without Ludwig and Wagner? Probably. They were just pieces in a larger puzzle. Perhaps being a mad but harmless king is better than being a tyrant. Or perhaps it ends up being the same thing. If you are new to Syberberg’s films, I’d say go straight to Hitler: A Film from Germany. And then if you are as amazed by the originality of that film as I was, you’ll want to see more even if it is in an undeveloped and dilute form like Ludwig, Requiem for a Virgin King. This is not a restored print, so the image is a bit rough around the edges. Watch Hitler: A Film from Germany first if you can.